Day 2 was all about continuing work on our cardboard creations for the Robot Petting Zoo. We were also getting used to the Design Sprint process we’ve been implementing. While the interns worked on building and adding artistic flare to their creations, they also learned some more programming skills. Some important blocks they got familiar with were the loop statements, such as forever, repeat, while, and for. They also learned about naming local variables and conditional statements, such as if-else. They used these blocks to be able to continuously repeat the different actions they wanted to incorporate into their project and were able to have more control over what they did. Besides learning how to program and design, another very important skill we cultivate in TechHive is the ability to effectively collaborate with each other. Our interns work together in all aspects of their projects, contributing to it with their different skill sets and gaining continual design feedback from each other. By working together, each group is able to learn with and from one another. 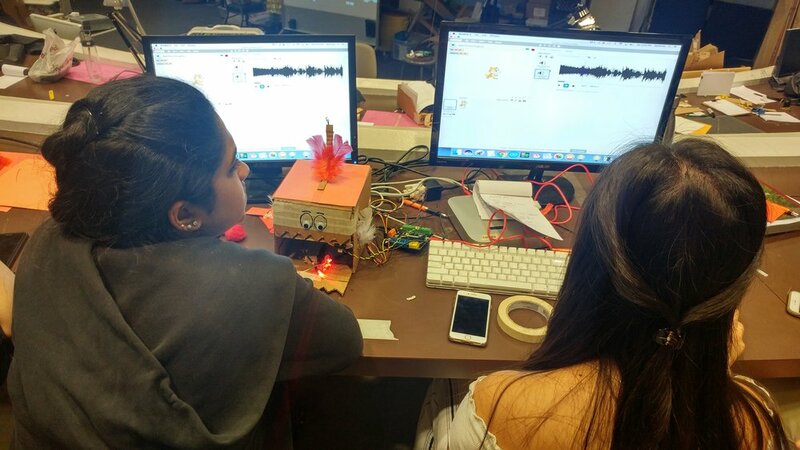 Last week, each group focused on using LEDs and motors to make their creations light up and move. This week, the focus of the day was to incorporate a distance sensor into their projects, which allowed for some interesting and creative ideas. 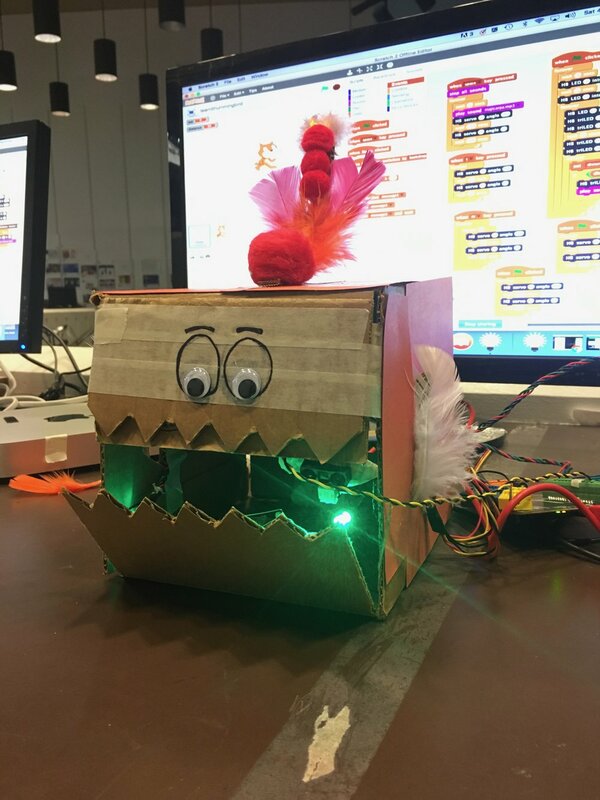 One team, Team KAEY, worked together to create a cardboard pokemon creation named Magikarp. They wanted their distance sensor to detect them throwing a “pokeball” at their pokemon. This would activate its tail to move back and forth, have the LED flash different colors, and play the pokemon theme song. 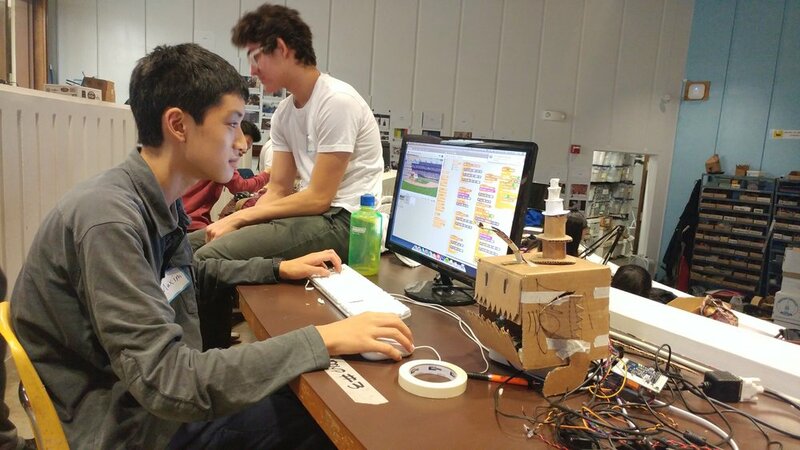 Team KAEY learned a lot while working on this project, such as how to incorporate sounds they found online, how to make the LEDs blink, and how to set distance blocks in Scratch for the sensor. They also learned how specific they had to be when programming. They realized that their program doesn’t know to make the movements stop after one second -- they had to be very intentional and tell it to do that. 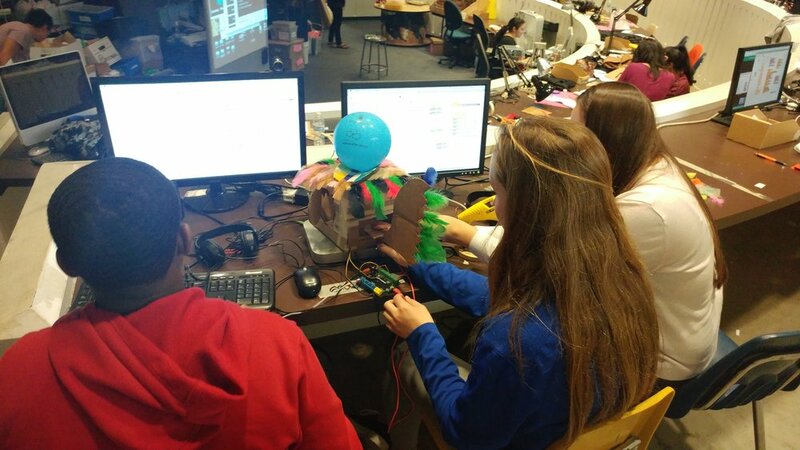 They struggled with troubleshooting and making sure their Magikarp could actually move and that the sensors worked. Every time they wanted to show off their project, it seemed like something would fall apart. But they looked at it as a learning opportunity and felt successful when it all came together in the end. During their mini-launch, Team KAEY realized that their peers noticed the color scheme and design of their project, but they didn’t necessarily know how to make it work. They’re planning on figuring out ways to make the functions and instructions more clear next week when we showcase our robots to museum visitors. They understand that their project has to be accessible, especially for younger children, and want to make sure it's a project they can enjoy. Overall, it was a successful and creative second day at TechHive! Older PostTechHive Fall 2017: Day 1 // Welcome to TechHive!